Masada Proposal Draft v. 2.15 Security Clearance Level: NTK10. Objective: Secure uncontaminated military and civilian population within the Liberty Defense Perimeter and prevent further spread of enemy combatants. 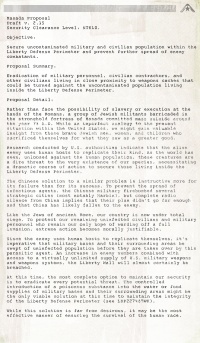 Proposal Summary: Eradication of military personnel, civilian contractors, and other civilians living in close proximity to weapons caches that could be turned against the uncontaminated population living inside the Liberty Defense Perimeter. Proposal Detail: Rather than face the possibility of slavery or execution at the hands of the Romans, a group of Jewish militants barricaded in the stronghold fortress of Masada committed mass suicide around the year 73 A.D. While an imperfect analogy to the present situation within the United States, we might gain valuable insight from these brave Jewish men, women, and children who sacrificed themselves for what they saw as a greater good. Research conducted by U.S. authorities indicate that the alien enemy uses human hosts to replicate their kind. As the world has seen, unloosed against the human population, these creatures are a dire threat to the very existence of our species, necessitating a dramatic course of action to secure those living inside the Liberty Defense Perimeter. The Chinese solution to a similar problem is instructive more for its failure than for its success. To prevent the spread of infectious agents, the Chinese military firebombed several strategic cities (most notably Harbin), but complete radio silence from China implies that their plan didn't go far enough an that China has likely fallen to the enemy. Like the Jews of ancient Rome, our country is now under total siege. To protect our remaining uninfected civilians and military personnel who remain our only hope of waring off a full invasion, extreme action becomes morally justifiable. Since the enemy uses human hosts to replicate themselves, it's imperative that military bases and their surrounding areas be swept of uninfected population before they are taken over by this parasitic agent. An increase in enemy numbers combined with access to a virtually unlimited supply of U.S. military weapons and weapons systems, the Liberty Wall will almost certainly be breached. At this time, the most complete option to maintain our security is to eradicate every potential threat. The controlled introduction of a poisonous substance into the water or food supplies of military bases and their surrounding areas might be the only viable solution at this time to maintain the integrity of the Liberty Defense Perimeter (see LDP227489WK). While this solution is far from desirous, it may be the most effective manner of ensuring the survival of the human race. This page was last modified 19:15, 24 April 2012.